Is Wearing a Cheongsam Cultural Appropriation? | WWAM Bam! I was given the okay to wear a Cheongsam (or Qipao) from my fiancé’s parents and himself, that should be enough, right? In a perfect world it would be. But the way that it is portrayed to other Asians might raise the question whether it is cultural appropriation because I am not Chinese. My fiancé took the view that if this was the case then we wouldn’t be able to wear a Cinderella dress, since the story originated from France. We aren’t French so we wouldn’t be able to wear it, right? He feels that if I wear the right accessories with the Cheongsam that it is okay to wear it. He mentioned that his grandparents were from Hong Kong and Mainland China (yes, there is a cultural difference). Unfortunately, being a Western woman it is difficult to see a line between what is acceptable and what not. Wearing a Hanfu with chopsticks in your hair can be offensive to people who have learned about Chinese clothing and their culture. Another offensive thing would be wearing an Yi (knee-length tunic) with jeans, a big no-no. That is taking something that is cherished in their culture and perverting it to something else. So, if your Chinese friends or family give you the okay to wear it, research the living hades out of it. Make sure you take utmost care picking out your outfit. My soon-to-be father-in-law told me that it needs to come from China or it won’t work. That’s because Chinese people know the difference. The best approach is to go an Asian Market near you and ask them where you can get one for Chinese New Year. Most of them will be very shocked but don’t be alarmed. Look around online and look for accessories to go with it. I found that flats are the best choice to go with a Cheongsam and they should match the dress. Red and gold is the most popular. Again, it is essential to do research. Your hair should be pulled back and made into a low bun or a side bun. You don’t need hair accessories because you want to keep it simple unless it’s suggested differently. Elaborate hairstyles are mostly for weddings. If you do the research you will find the answer you seek. I am marrying into a Chinese family but you don’t need to have ties to wear a Cheongsam; just be respectful. Make some Chinese friends and learn from them. They will tell you their opinions and most of the time will be happy to help you find one. When I was growing up I befriended an older Korean lady and she told me all about Korea. She owned an Oriental store on an Air Force base and would invite me to have tea with her every time I went there. I asked her what was acceptable to wear and she told me that as a Western woman you have to be careful with what you do and wear. A Kimono, a Cheongsam, a Hanbok, and an Aoi dai is sacred, you have to be respectful of each story it holds; because if you don’t, then the Gods will look down on you. What are your thoughts on cultural appropriation? Have you had any experience wearing traditional Asian clothes? Bridget Jones – Just the Verbally Incontinent Spinster China is Missing? Thank you so much! Yes they were ecstatic when I told them that I’m interested in Chinese culture. When I wore my Cheongsam they were absolutely thrilled. I wore a chewing same dress for my wedding to my Chinese man. His family had no issue with wearing that and wished I went even more traditional with the wedding dresses. I’m a bit surprised but not completely about the feeling of cultural appropriation. We are in a world of SJW (Social Justice Warriors) some believe that if we are not of that culture we aren’t allowed to wear clothing or even do anything with that culture. Thankfully we are marrying/married to a beautiful and extensive culture that welcome other people into it. There is the argument that wearing Native American clothing (not headdresses) but wearing moccasins is cultural appropriation. It is a huge controversy in America right now and I feel like it has gotten worse. That is a very American mentality sort of. They want to be so politically correct that the matter is getting out of control by so much overthinking and drama. I find some Westerners to be a bit over sensitive. The Qipao is not in the least “traditional” Chinese attire, nor do the vast majority of Chinese know the difference. The Qipao is actually an early 20th century adaptation, in essence like a vintage 1920s cocktail dress. In an ironic twist, it wasn’t adapted by women until the Qing dynasty was already overthrown. The form hugging silhouette is actually extremely modernist in design and its popularity in the early 20th was because it was so new and a break from tradition. There are no religious taboos associated with clothing in China nor racial cultural hangups because the Chinese simply don’t care what you or they themselves wear. They are are practical like that. No one will bat an eyelash at a white woman wearing a Qipao in China and mostly they will be amused or delighted and at worst mistake you for a waitress. If you really want to be avante garde (or rather reactionary) nowadays to impress your in laws, you should show up in something like this. Haha, not me, I just picked out a photo from the internet where the person wearing it wasn’t a professional model. I think the idea of the Qipao as Chinese “traditional” attire sprang up because of the ubiquity of the Mao suit. After a couple decades of EVERY woman wearing unisex navy blue, army green, or grey trousers and jackets, I suppose the Qipao began to be associated with “tradition” when in reality it’s heyday was during the Chinese Republican period. Personally, as a Chinese, I don’t see a non-Chinese wearing the qipao as culturally appropriating it. Qipao looks flattering if you have what it takes to wear it and it is really a beautiful attire. Strictly speaking though, it is the hanfu 汉服 that should be considered the traditional Chinese dress. Qipao is in fact, Manchurian. When the minority Manchus came to power (1644-1911), they banned the hanfu. 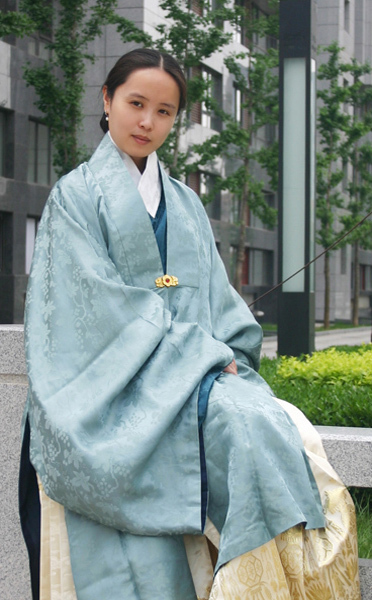 Hanfu was the traditional dress of the majority Hans. Hanfu is cumbersome for the modern age no doubt , but it is far more graceful and a joy to behold! and to me personally, it better represents the spirit and essence of the Chinese people. I wish the hanfu makes a comeback and be worn on special occasions and that will keep a beautiful attire from being lost to posterity and help keep tradition running. If the Japanese can still be proud of the kimono and the Koreans the hanbok, more so should the Chinese be of the hanfu from which both the kimono and hanbok owes their origin and a lot to. 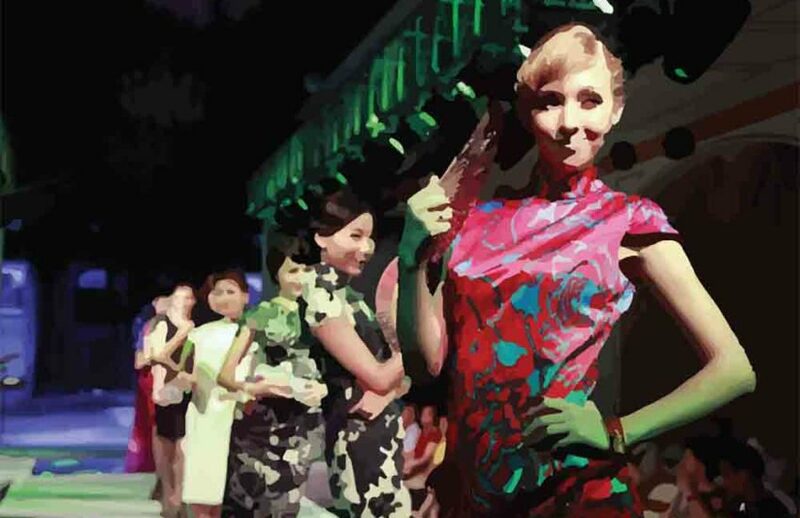 Wearing the dresses isn’t culture appropriation per say, as long as you’re wearing them at the right events…but to wear a Qipao at a down to earth food festival where people will be wearing jeans…that is just awful. Totally agree, Eileen. You have to wear a dress appropriately! I have since learned about the phenomenon of cultural appropriation, and as I am white I have not felt comfortable wearing it. I’m attending a wedding soon and would really like to get some use out of this dress. This is a very interesting discussion to follow. When I adopted my daughter in China, I purchased a little red (for the Spring Festival) qipao for her, along with all the other new parents. We were under the impression that we were showing respect for Chinese culture with these purchases. Jump forward 13 years; I found my daughter’s birth parents, and we established an on going relationship with her Chinese family. They gave my daughter the gift of a very beautiful (and expensive) all silk blue and white qipao. From our point of view, it was the most beautiful dress she has ever had. But, her parents had never gotten qipao’s for her two older sisters, and none of their friends bought qipaos for their daughter’s either. However, when our U.S. university’s Chinese Student & Scholar’s association sponsor the yearly Spring Festival performances the women onstage all wear qipaos with high heels. I am not sure if they were catering to western expectations, or if this is customary formal wear for the new year if you can afford it. I think that the qipao is an incredibly flattering garment for women to wear, and very elegant and beautiful design. I have noticed on StyleWe (a website that sells garments made by Chinese designers to the U.S. from Guangzho), that there are always designers who offer qipao like designs with a modern twist! This is a very interesting discussion to follow. When I adopted my daughter in China, I purchased a little red (for the Spring Festival) qipao for her, along with all the other new parents. We were under the impression that we were showing respect for Chinese culture with these purchases. Jump forward 13 years; I found my daughter’s birth parents, and we established an on going relationship with her Chinese family. They gave my daughter the gift of a very beautiful (and expensive) all silk blue and white qipao. From our point of view, it was the most beautiful dress she has ever had. But, her parents had never gotten qipao’s for her two older sisters, and none of their friends bought qipaos for their daughter’s either. However, when our U.S. university’s Chinese Student & Scholar’s Association sponsor the yearly Spring Festival performances the women onstage all wear qipaos with high heels. I am not sure if they are catering to western expectations, or if this is customary formal wear for the new year if you can afford it. I think that the qipao is an incredibly flattering garment for women to wear, and a very elegant and beautiful design. I have noticed on StyleWe (a website that sells garments made by Chinese designers to the U.S. from Guangzho), that there are always designers who offer qipao like designs with a modern twist!